That's based on information collected so far from the flight data recorder recovered in Ethiopia. ADDIS ABABA, Ethiopia — Preliminary information from the flight data recorder of an Ethiopian Airlines plane that crashed a week ago and killed 157 people shows “clear similarities” with an earlier disaster involving the same kind of Boeing aircraft in Indonesia, Ethiopia’s transport minister said Sunday. The crash of Ethiopian Flight 302 on March 10 and that of a Lion Air plane in Indonesia in October – both of them Boeing 737 Max 8 jetliners – have prompted the United States and other countries to ground the aircraft. The U.S. Federal Aviation Administration has already said satellite-based tracking data showed that the movements of Flight 302 were similar to those of Lion Air Flight 610, which crashed off Indonesia, killing 189 people. Suspicions emerged that faulty sensors and software may have contributed to the crashes. Moges said the Ethiopian government intends to release detailed findings within a month. Family members said they were given a 2.2-pound sack of dirt from the crash site. 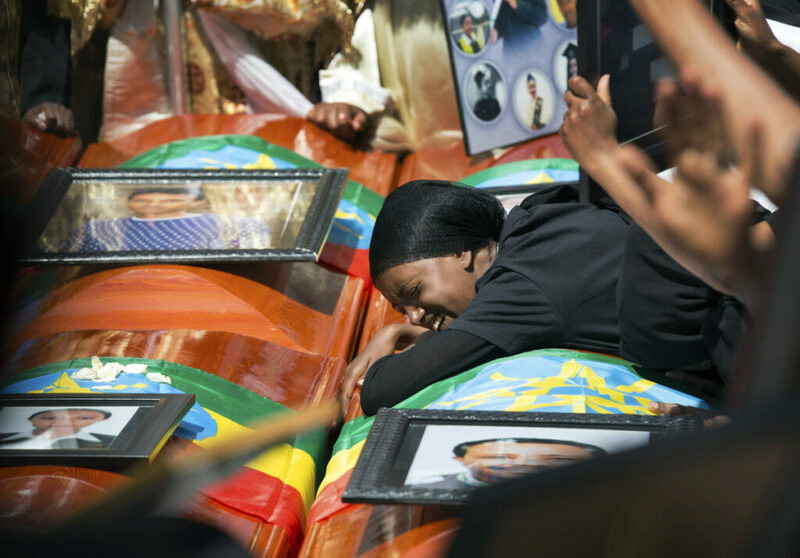 Many relatives already have gone to the dusty field outside Addis Ababa where the plane went down to pay their respects.